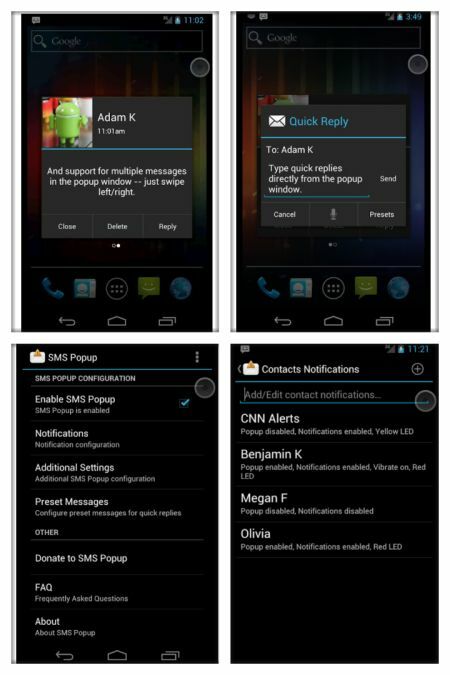 Handcent SMS has the Pop-Up notification feature. So every incoming SMS can be directly displayed on the screen and the user can quickly reply the messages without having to open the application first. You can also install themes, plug-ins and even custom fonts. Another feature is Scheduling messages that are useful to write SMS now and send automatically later at certain times, such as birthday greetings. It can also can block SPAM messages by using BlackList feature. If your phone automatically converts text messages to MMS if you write more that 3 SMS (480 characters), you can use Handcent SMS to solve your problem. 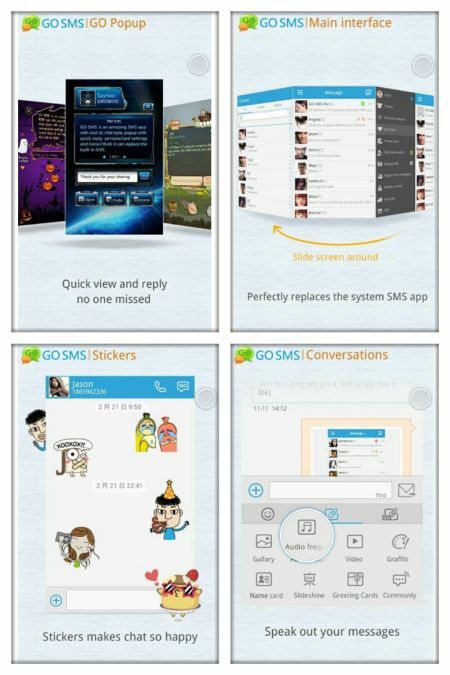 Go Dev made a lot of interesting applications for Android, some of them are Go Launcher, Go Locker, Go Dialer and others. They also the maker of GO SMS Pro that we discuss here. 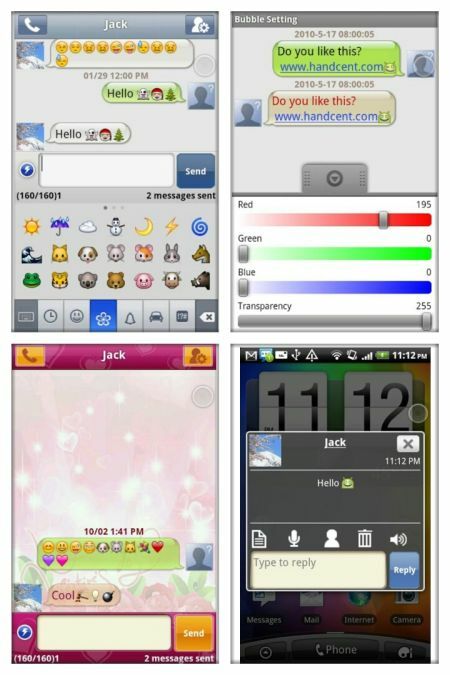 You can change the look and color (skins) of this messaging app, you can also install the plugin and widget, such as widget to display recent messages. Top installed plugins for this app is Emoji plugin and also FBChat so that you can directly chat with your Facebook Contacts directly from the GO SMS Pro. Another excellent feature is that it can backup and restore SMS either locally on phone memory or to Dropbox (Cloud Storage), scheduling SMS and also pop up notifications. For notification feature, it has advantages because if there is an incoming SMS, the user is given the option to quick reply at that time or make To-Do or reminders to reply later. 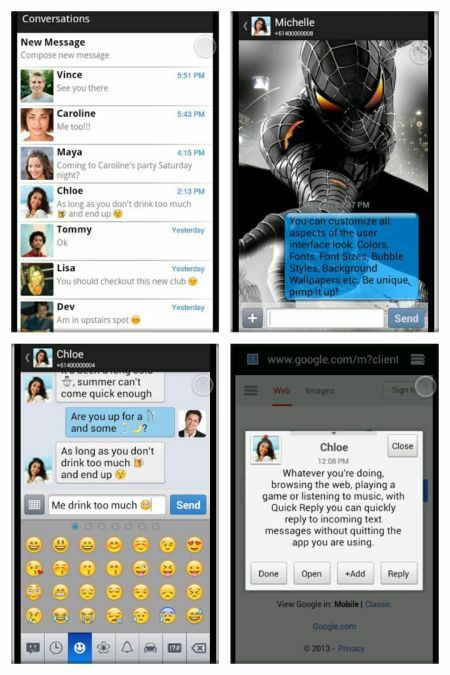 Chomp SMS is another alternative text app. It has features not much different than Go SMS and Handcent SMS such as Pop Up Notifications, Blacklist SMS, Scheduling SMS and can also install themes, backgrounds, plugins and widgets. SMS Popup is useful if you need pop-up notifications without changing the default SMS application. So this application is an additional app and not a replacement app like other SMS applications we mention above. When there is an incoming SMS, the message will immediately appear on the screen without having to open the messaging app first. The user will be able to reply text messages immediately. If there are multiple incoming SMS, user can swipe between messages to view it. There is a setting to not display a message when the phone is locked so you won’t have to worry somebody read your message without your acknowledge. Moreover, it can be set to turn off pop up notification just for some number or contacts you choose. Thus the choice of four Android SMS application. The four applications actually have features that are not much different, choose the one that you think the best.